Curated by RE:ARTISTE and The Espejo Organization for the Arts, this exhibition will present the work of international self-identified female artists and offer a debate on women’s sexuality, prejudices, rejection, and safety. NEW YORK, NY. 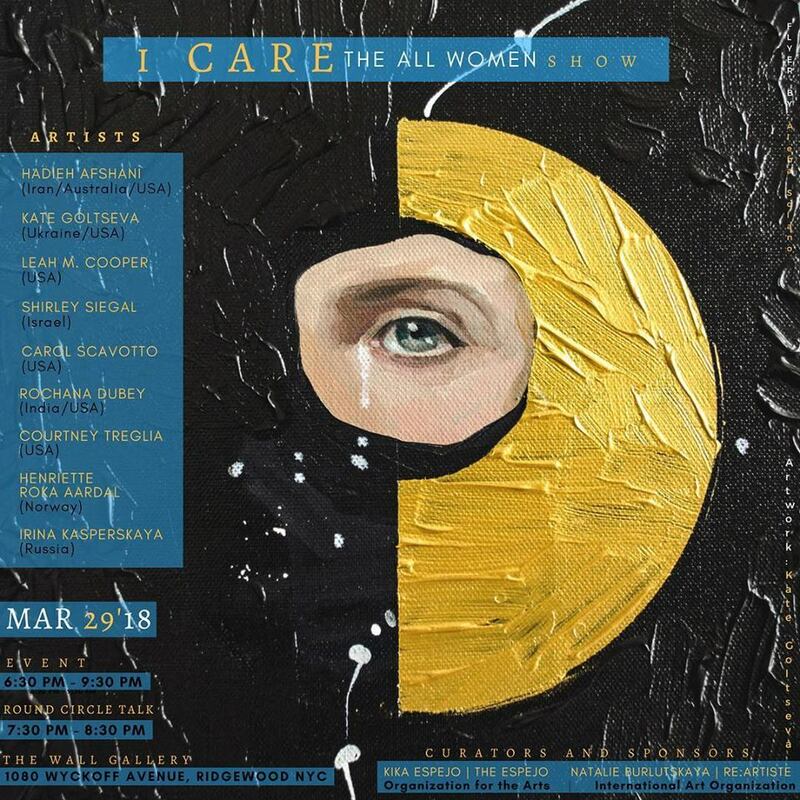 - On March 29, 2018 at 6.30 pm, RE: ARTISTE International Art Organization and The Espejo Organization for the Arts (EOarts) will present “I Care: The All Women Art Show and Discussion”, the art event hosted at The Wall Gallery, which will offer a platform for self-identified female artists and women of all occupations to connect and speak up. This was the first off-line public presentation of the ”I CARE FOR” (#ICareFor) Campaign; a project created by RE:ARTISTE’s founder and curator Natalie Burlutskaya. Burlutskaya has been campaigning for woman’s rights long before the "Me Too" and "Time's Up" movements. Burlutskaya created The Art & Social Project "The Female Power" back in 2015 as a platform for exploring, sharing, and creating alternatives for women issues that connected female artists from all over the globe. The #ICareFor campaign first started as an International Women’s Day event and expanded, eventually creating a network of women artists with passions about the future, art, children, nature, culture, education, and more. The show presented the works of international female artists who participated in the online campaign including Hadieh Afshani (Iran - Australia - USA), Kate Goltseva (Ukraine - USA), Leah Miriam Cooper (USA), Shirley Siegal (Israel), Carol Scavotto (USA), Rochana Dubey (India - USA), Courtney Treglia (USA), Henriette Roka Aardal (Norway), and Irina Kasperskaya (Russia). As well as the art exhibit, the roundtable discussion will be hosted during the event, in which the audience will be invited to discuss their experiences with and views on women's sexuality, prejudices, rejection, and safety. Panelists: Brooke M. Haney, artistic producer at "Daughters of Troy", director at "Unconventionally Intimate", actress, professor; Igor Kovalov, artist, graphic designer, artistic direction advisor for RE:ARTISTE. The exhibition and discussion both aim to offer a space where to identify and assign new agents of change and a new perspective on the challenges faced by women today. The exhibition is curated by RE:ARTISTE, an international art organization exposing emerging and established artists to the audience of curators, buyers, art enthusiasts. RE: ARTISTE promotes the idea that art is a powerful peacemaking force. Through the artists’ visions, RE:ARTISTE hopes to be able to view the unseen and enable voices that are not often heard anywhere else. The Espejo Organization for the Arts (EOarts), an arts management organization based in New York that supports and promotes the work of mid-career and emerging international artists and creative professionals will sponsor the exhibition. Since 2013, EOarts has developed programs such as workshops, exhibitions, publications, and art residencies with the mission to create an international and multicultural arts community in the United States. Off of the L train Halsey stop.